This is my very first post about a dessert. That’s because I don’t bake! I am not a big sweets eater and I hate measuring things, so desserts are just not one of my favorite things to make. A few years ago my dear husband was having major issues with his sciatic nerve. He had been bed ridden for a couple of months and the elders from our church wanted to stop by and pray with him. I couldn’t very well offer them potatoes (my favorite food EVER), so I scoured cookbooks and the internet and found this recipe. It is not overly sweet, is easy to make, and delicious! Preheat the oven to 375 degrees. Grease and flour a 9″ cast iron skillet. A cake pan will work but there’s just something about the cast iron that really makes this a wonderful cake. In another medium bowl, (I used a stand mixer), cream together the sugar and butter until light and fully incorporated. Add the egg and yolk, one at a time, beating for 1 minute between the additions. 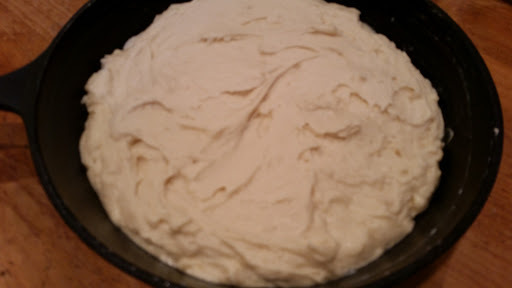 With the mixer on low, add half the flour. Beat until well combined. Add the buttermilk and mix until incorporated. Finally, beat in the remaining flour until almost fully incorporated. Continue with a spatula to fully incorporate the flour. Pour/spoon the batter into your prepared pan. This is a very thick batter. Smooth the batter in the pan evenly. Bake for 30 minutes or until a toothpick inserted in the center comes out clean. While the cake is baking, make your praline sauce. 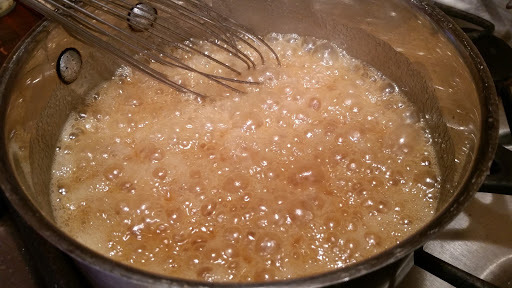 Combine the brown sugar, butter, cream, and salt in a medium saucepan. Bring to a soft boil and let boil for 3 minutes. Keep an eye on it and stir often to prevent it from boiling over. Remove the cake from the oven. Transfer to a cake plate and while the cake is still warm, pour the praline sauce over the whole thing. Super easy…super delicious…you must try it!